“In the new SuperKEKB accelerator in Japan the first collisions of matter and anti-matter particles have been detected. Scientists from LMU and the Universe Cluster are involved in the experiments. Particle physicists have been waiting for this moment for a long time: On 26 April 2018 at 0:38 GMT+09:00 at KEK (Japan’s High Energy Accelerator Research Organization) in Tsukuba, beams of matter and anti-matter particles collided for the first time in the new SuperKEKB accelerator. News of this success came from the detector, too: The Belle II instrument, which is also a new development, “saw” and recorded the particle tracks produced in the collision. Scientists hope the experiment will help them to understand why the original balanced ratio of matter to anti-matter in the Universe changed, so that it now contains virtually none of the latter. What is the key to solving the matter/anti-matter mystery? 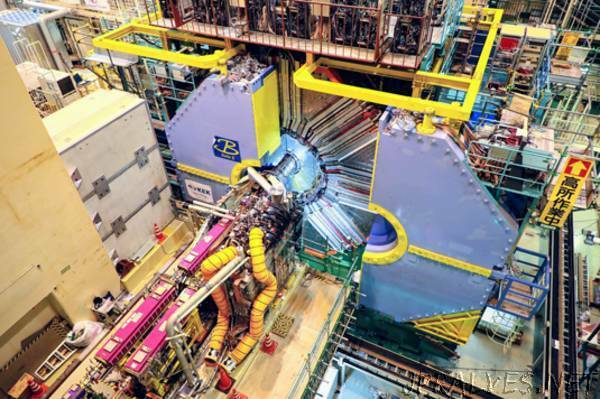 Scientists are trying to find it in the decay patterns of short-lived particles, B-mesons in particular, where a slight excess of matter can be observed. B-mesons are pairs of quarks with a particular characteristic: One of the two quarks is either a beauty (B-) quark or the corresponding antiparticle. B-mesons are produced when electrons and positrons (anti-electrons) collide and annihilate each other. Eight years ago, upgrade measures began on the KEK accelerator and the Belle detector in Tsukuba. The objective of this major project is to increase the previously attainable yield of B-mesons by a factor of 40: During the next 10 years, the SuperKEKB-Belle II combination is expected to produce and evaluate around 50 billion B-mesons. This enormous increase in the volume of data also enhances the chance of finding the sought-after decay pattern. Scientists from LMU, the Excellence Cluster Universe, the Max Planck Institute of Physics and the Technical University of Munich (TUM) are involved in the construction of the innermost detector and in the development of the software for evaluating the data. A crucial innovative feature of the SuperKEKB is a newly designed positron ring and a complex system of superconducting magnets that keep the particle bunches on track. The new Belle II detector, whose functions are perfectly matched to the facility, will be commissioned at the same time as the upgraded accelerator.